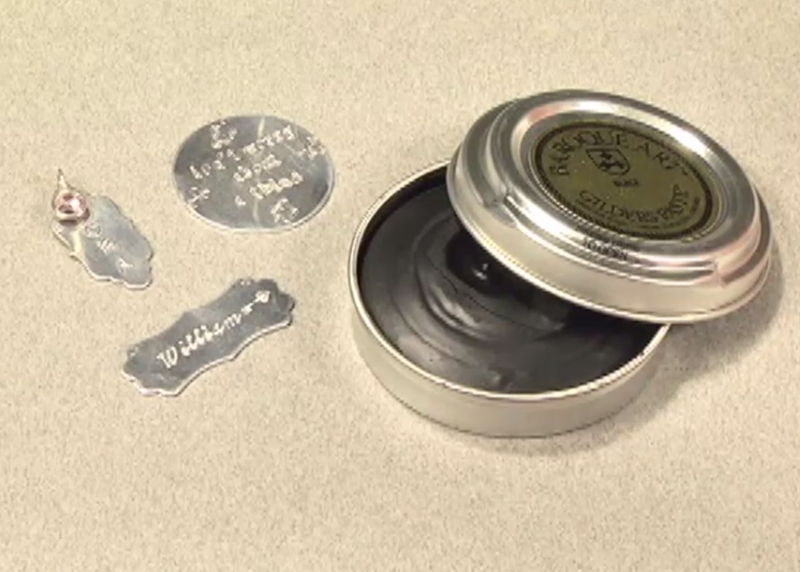 Introducing a new product that will darken your stamped impressions: Gilders Paste! We were so excited about an alternative to the trusty Sharpie that we took some newly-stamped pieces and shot a new product video to show you how easy it is to use. Gilders Paste comes in the smart little 1.5 ounce container you see at left. It looks a lot like shoe polish and smells like it, too. That small container holds enough paste to cover thirty square feet so your $11 will really go a long way! Gilders Paste will stain your fingers, so we recommend applying it with a Q-tip, paper towel, or cloth. It dries to the touch after ten minutes and is completely cured in about twelve hours. There is no smell whatsoever once the paste has dried and you put that cap back on the container! Gilders Paste works with every metal, though it is most exciting for those who enjoy working with Aluminum blanks since we are not able to use Liver of Sulfur or Silver Black on aluminum. There has never been a more permanent option for darkening impressions -- until now! With Gilders Paste, you can be sure that once you 'apply and let it dry,' you can swim the English Channel with your stamped pendants and their darkened letters will remain intact! It's that water resistant! In fact, we put our stamped blanks through the dishwasher to see how they would hold up. Sure enough, those impressions remained dark even after the hottest cycles. Check out our Product Video to see how we apply it and just how easy it is to use. Thanks for the tips and video--am looking forward to using this paste! Can you use this on Sterling silver and Brass? Yes, you can use Gilder's paste on all sorts of metals.